ARE YOU GOING TO WEAVE TODAY? I probably make a thorough nuisance of myself at weaving events like the Encuentro de Tejedores in Cusco Peru earlier this month. I have so many questions and want to be into everything and not miss a thing. Calm and serene despite being in the very heart of the city of Cusco, the venue for the conference was beautiful both by day and night. There were plenty of pillars to which looms could be attached for weaving displays and shaded areas under the arches where weavers could show their textiles. Bright and early on day one, I registered along with other participants. The receptionists, looking smart in their uniforms with colored conference scarves and headbands, were efficient and clearly trained to be able to handle anything. The whole process was very slick and it was interesting to hear all the different Spanish accents and Quechua being spoken in the line-up of participants from all over Peru and South America. I recognized fondly the accent from Chile where I lived for five years as well as the song of the Argentinean-style of speaking used by my ex-boyfriend and the special way that Bolivian highlanders pronounce “rr”. I then stepped outside to the courtyard to another world…a buzz of colorful activity… where I watched all the stands being assembled by weavers from all over Peru, Bolivia and Latin America, saw all the marvelous textiles emerging from travel sacks and being arranged and labeled, touched the fiber, tools and implements which were used to create the colorful cloth and spoke with the creators themselves. Some of them seemed somewhat overwhelmed by the high level of interest in and admiration for activities that are quite normal and commonplace, almost passing without remark, in the communities, villages and towns where they live. The question that I really wanted to ask everyone right there and then is “Are you going to weave today?” Is today the day when we will get to sit by you and see how you created all these exquisite textiles? And all the while the excitement is building as I see more and more gorgeous textiles and looms being extracted and arranged. I had already seen at least ten things that I wanted to explore further after having passed just once quickly by each of the twenty-two half-erected stands. Weavers and spinners from the Navajo Nation, my friend from the Tinkuy, DY, and TahNibaa and Albina from San Ignacio de Loyola showing the crocheted “chullos” and the belt loom full of sticks which is typical of her community. The Chol Chol Foundation of Chile was present bringing with them textiles made by the Mapuche weavers that they support including a spectacular ikat- patterned “manta cacique”. Lowland areas of Peru were also well represented with a group of Matsigenka cotton spinners and weavers from Echarate, Bajo Urubamba. 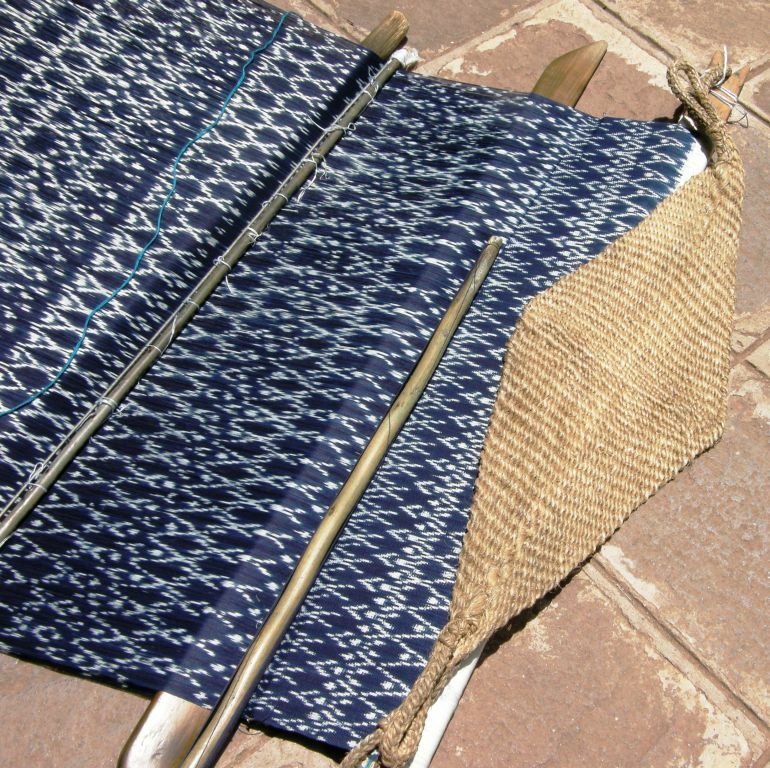 A horizontal loom with a broad belt patterned with double weave and complementary-warp pick-up patterns of Taquile Island and a backstrap loom with a cotton warp-float piece in progress from Echarate. The simple backstrap loom of Tacabamba, Peru on which the indigo ikat-patterned “pañones” are woven. The process of creating a pañon is anything but simple. They are up to one-meter wide, covered with tiny motifs and have patterns knotted into their fringes. A floor loom from Ayacucho, Peru with a tapestry in progress and the leaning vertical loom of Tarabuco, Bolivia. The cotton weavers of Chiclayo managed to preserve their native cotton despite the fact that its cultivation was banned for many years in Peru. The backstrap loom is used to weave their natural brown and white cotton into saddle bags, belts and table ware for their own use. The Guatemalan loom from Santiago Atitlan holds brocaded cotton cloth destined for the typical woman’s blouse or “huipil”. Panels are sewn together and the neckline embroidered with birds. Wide warps, narrow warps and everything in between… A Tinkipaya weaver’s leaning vertical loom, holding fabric covered n complementary-warp pick-up patterns, rests on the ground. 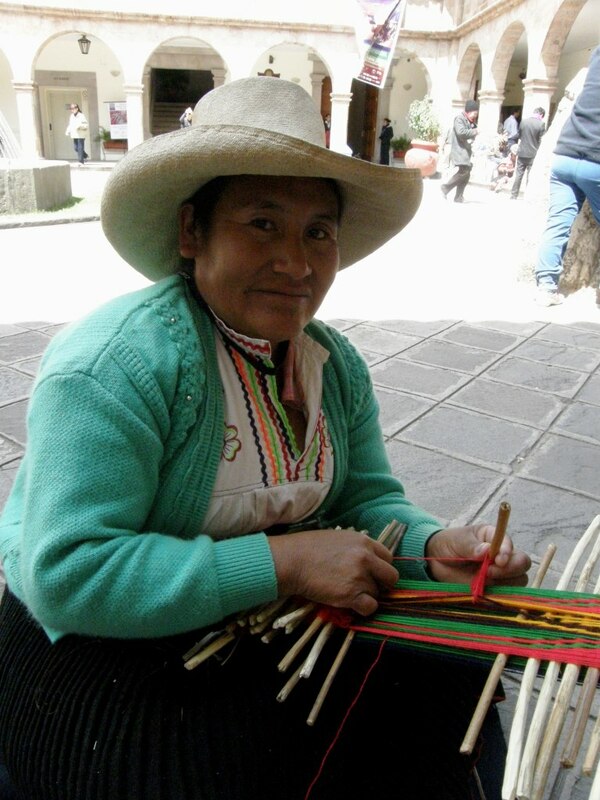 A weaver from Pitumarca speedily edges her finished woven lliclla with a tubular woven band using three sets of string heddles and a shed loop. 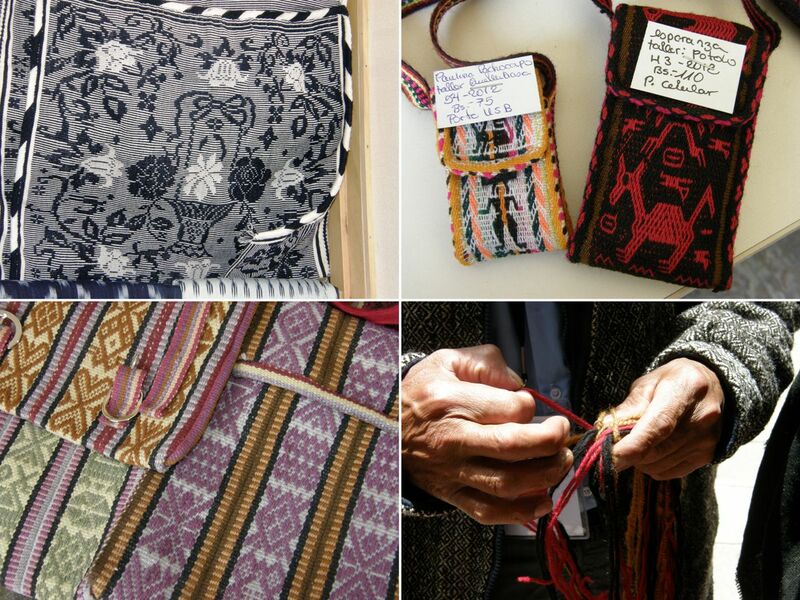 A backstrap weaver from Ayacucho, Peru, creates a belt patterned with supplementary warps. She uses a forked stick to hold a secondary cross, the manipulation of which helps her to open the heddle shed quickly and efficiently. The wide backstrap loom parked against the pillar is from Tanta, Peru where handspun alpaca yarn is often combined with bright synthetic threads to make shawls, ponchos and blankets. And then there was that tantalizing backstrap loom with its twenty-four heddle sticks…Señora Araceli, are you going to weave today? First Araceli has to make the twenty-four sets of heddles on this fresh warp. The pattern has already been picked up and saved on sticks. Just before lunchtime one day when we were indoors listening to speakers, I got the uneasy feeling that I really needed to be somewhere. I got up and tip-toed out at the start of the morning’s final presentation by Manos del Uruguay to find Araceli seated and preparing her warp for an afternoon session of weaving. Well, you know that I am fascinated by the entire process and so I was happy to be able to sit alone with her and watch her make her heddles. I was tickled to see that she makes her heddles with the extra security hitch just as I have chosen to do. I have seen and learned so many ways to make string heddles for backstrap and other kinds of weaving and this method is by far my current favorite. I always say “current” as who knows what cool new method I will find tomorrow. Here is a short video clip of Araceli making her heddles. She certainly has a smooth and elegant way of doing so. I know some people don’t like making heddles and dread that part of the process…I like it! And what about the woven cloth produced by these looms and the pieces produced by talented hands using knotting, braiding and crochet? Head gear…Crocheted “chullo” from Peru and a woven hatband from Bolivia. There are four countries represented here….cloth from Mapuche weavers in Chile, Salasaca, Ecuador, Taquile Island, Peru and Tinkipaya, Bolivia. Cloth from different corners of Peru. The variety! Of course, each piece has its story and it was those stories that we were told in the weavers’ own words in the seminar sessions that were held in the mornings and afternoons. The stories were very inspiring and educational, often with very personal touches which brought life and meaning to the fabric that simply could not be transmitted from the market stall or loom alone. All told of hope, perseverance, strengthening of ethnic identity and a revival of pride in oneself and culture and were often very moving. The faja sara ( the one created with the twenty-four string heddles) has its own fascinating story. 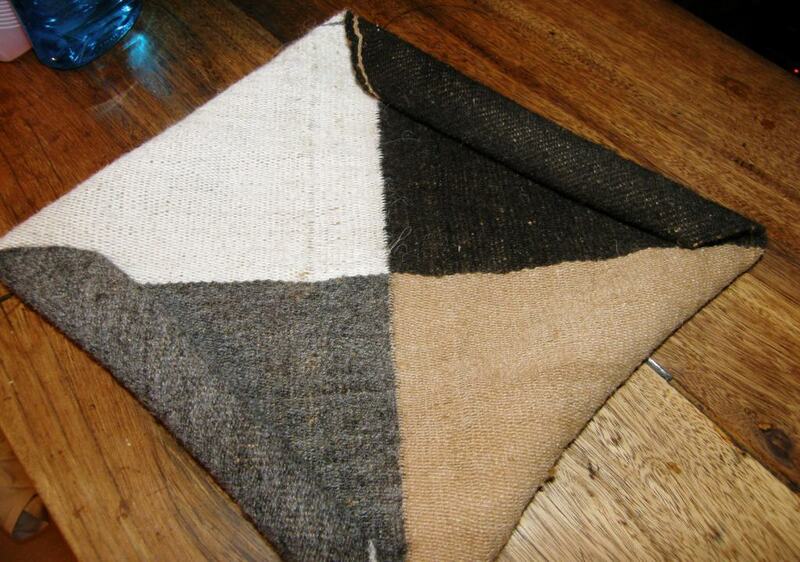 It is part of an unbroken weaving tradition that dates back at least 500 years to Incan times. The belt is described in the chronicles of Mercedarian Friar Martín de Murúa in 1590 A.D. and the knowledge of how to create one has been passed on ancestrally over all these years. Lynn Meisch has written an article about her research on these belts here. We were told by the weavers that the name “sara’ comes from the verb ”sarear”, although I have never come across this verb before, which means to choose, or in a weaving context, to pick-up. Interesting to me from a structural point of view is the rolled edge of the belts which is surprisingly easy to create. I am guessing that it serves the same purpose as the woven bands I have seen added to other textiles in that it strengthens the edge. When I was in Holland, Marijke van Epen and I followed Mirja Wark’s explanation of the rolled edge used by the Wayuu people of the Guajira Peninsula in Colombia and Venezuela and the way the weavers of the sara belts create theirs is equally as interesting and practical. Here is Araceli in action with a band of spectators. When doubt was expressed by the onlookers about the quality of the cloth since Araceli does not use a ruki, the llama bone tool, to beat in her weft, Araceli immediately invited them all to feel the belt. They were all surprised and impressed by the firmness of the weave. It is a very dense piece of weaving. The poncho shown above is from Catamarca Argentina and represents the recovery of the exquisitely fine work done with handspun vicuña fiber on floor looms which has the made the poncho Catamarqueño famous for centuries. Two people weave the pieces side by side and have to coordinate the strength of their beat perfectly to maintain a consistent weave. With the fine vicuña thread a piece that measures 2 meters by 1.30 meters weighs only 320 grams and takes up to eight months to complete. 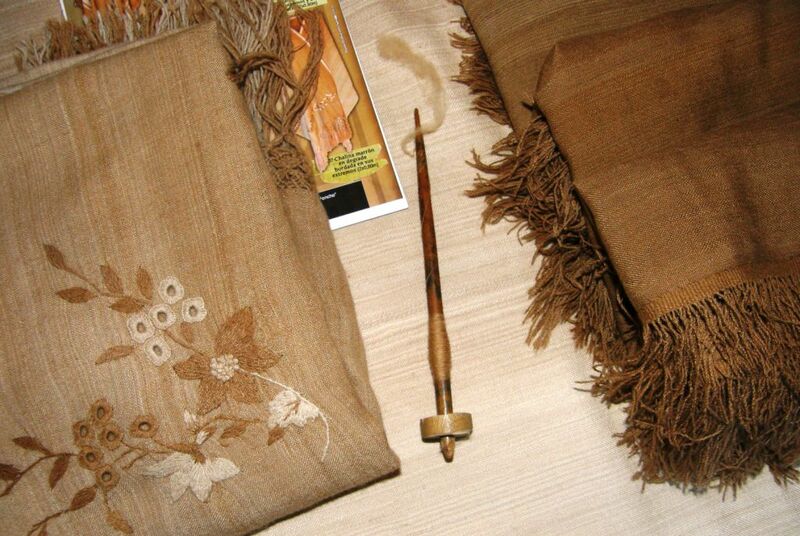 Fine vicuña shawls are also woven and embroidered using designs copied from old colonial textiles. We had a chance one afternoon to handle and clean pieces of vicuna fiber and everyone was invited to try their hand at spinning it on the 25cm spindles. …. a bulsico , or cotton double-pocket saddle bag from San Ignacio de Loyola with beautiful patterns in simple warp floats worked in two colors. 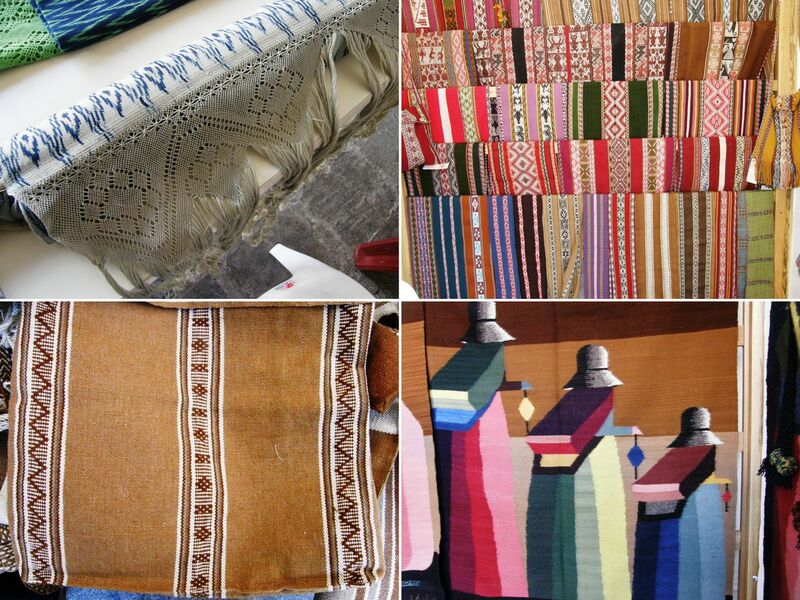 The weavers from Tarabuco and Potolo in Bolivia of course brought large fine examples of their textiles. I decided to show you here some very small and practical pieces that they also brought to sell. The tiny USB pouch is from Tarabuco and the cell phone pouch with its woven khuru figures is from Potolo. The supplementary-warp patterned pieces in lovely pastel colors are from Ayacucho, Peru and the last shot is of an impromptu sling-braiding demonstration from one of the Peruvian presenters in the coffee break. Diana from Santiago Atitlan in Guatemala showed me how to wrap her hair and head with a woven hair sash. You can see that most of the band is plain red with just the last part, which will be seen on the outside, decorated with pattern. Albina’s husband showed me how married men wear the typical chullo of his home…with the flaps standing out sideways. A single man will wear his with the flaps pointing out front and back. So, now you have seen a selection of the stands, looms and textiles and heard a few backgroud tidbits about some of the weavings and the people who produce them. You are probably dying now to see the weavers in action, right? Sorry, but I am saving that segment for the next blog post as uploading the video will be so much easier for me when I am in the US. In the meantime I am packed and ready to leave tomorrow and I did manage to finish the discontinuous warp piece that I started in the workshop on the last day of the Encuentro. Handling alpaca fiber is not a nice business in this heat with sweaty hands, I can tell you! 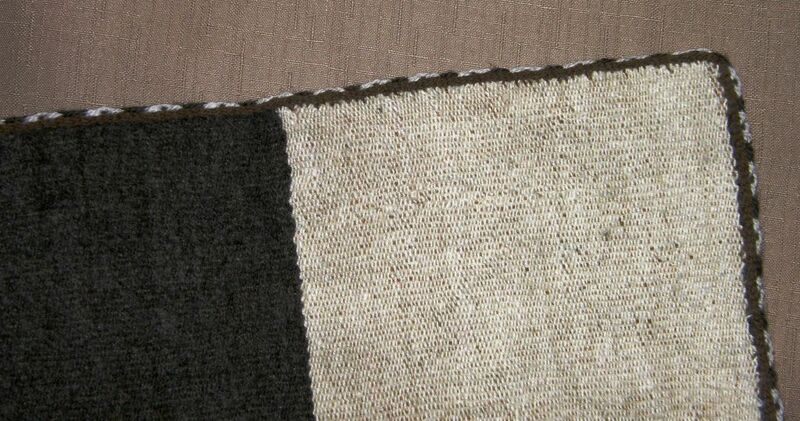 The overspun alpaca yarn made the grey and black panels curl in and the other two panels curl under. You can see my finish line on the white panel. I ended up removing one weft as I had packed too many in. I really need to remove two as now I have two wefts in the same shed. The finish line isn’t as noticeable on the other panels. I am really pleased with this! I wove and sewed on a tubular band to the edges…. … in the same way as the Pitumarca weaver that I showed earlier in this post, using three sets of string heddles and a shed loop. See how nicely the piece lies flat now? I hemmed the sides before applying the tubular band because I didn’t like the way the warp stripe at the edge was interfering with the color of the tubular band. Done! I am keen to try this all again! Parece muy corto el tiempo que dura el Encuentro como para disfrutar tanta belleza. Sin embargo nos has dado una muy rica visión de ello. Ansiosa por ver los videos…! I’m in awe of all the beautiful photos. 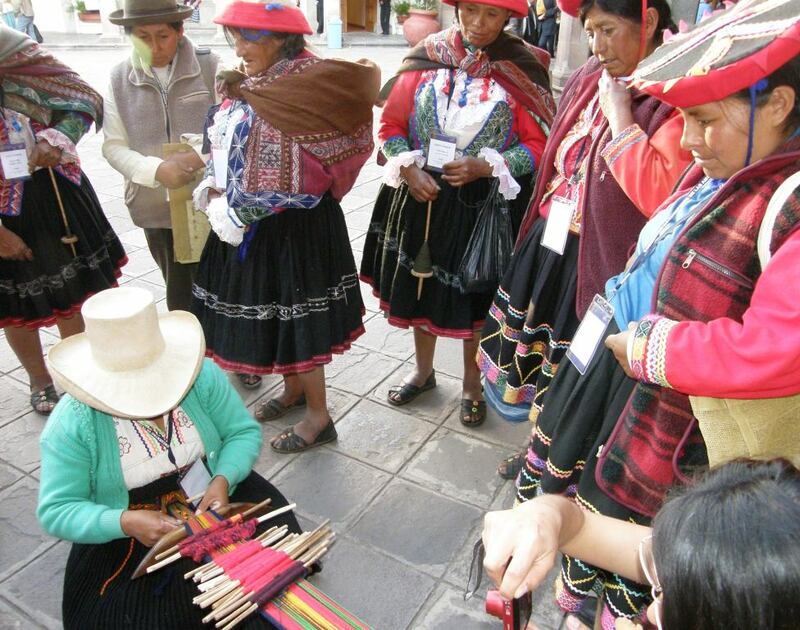 Great variety, wonderful that so many women could make it to Cusco. I’m so happy you put on the video of Araceli. I don’t mind doing string heddles, but feel soooooo stupid for never realising you can put the whole string under all the warps you want to pick up in one go, I always work through a little ball for every warp to pick up….duh, sometimes things can be so easy and made so hard….next time my heddles will go a lot quicker. We just had a cycling couple here and the girl was keen to learn to weave, so we went through your first lessons and she picked it up in no time. Left the house the next day with 3 keyfobs in her pocket! Looking forward to more videos next week. All the best for your trip to the US. What an experience! and did you realise how you linked to a wealth of textile information just from the link to the Meisch article? If you click on the right hand link at the beginning of her article it gets you through to the records of the Textile Society of America symposiums and their newsletters! Riches indeed! Thank you, and enjoy your trip! Lately I am unable to access the links you mention, I am wondering: is it my pc or does someone else have the same problem? Such an amazing meeting. Thank you so much for all the photos. I can feel the excitement between the lines of your report . i wish you a save trip to the US. I want to say I especially like,,,well, all of the above work! Wow! There are some things there that I would like to try to weave. 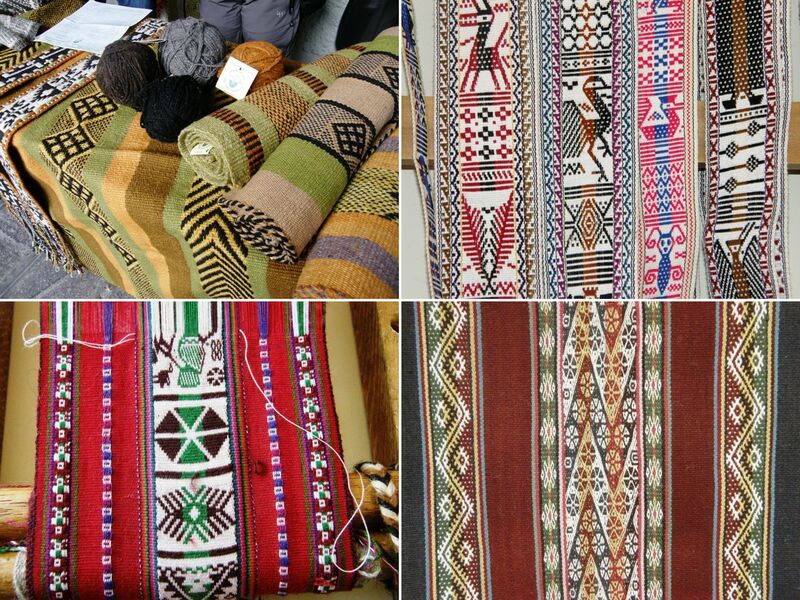 What an overwhelming display of the weaving arts of indigenous peoples. I’m in love with this post. Your posts are always full of such rich and colorful, inspirational photos! This one has SO MUCH EYE CANDY! Wow! What a gathering/experience! Thanks again! I am in awe at what a treasure trove of exquisite weaving I have stumbled upon here. The photographs are inspiring and I can imagine how validating it must have been for all these weavers to gather and have their work appreciated. I was simply on a search for “four strand braid” depictions, I found your video ( I like that slick trick with the fingers in loops!) and look where it took me! What a fantastic site. thank you so much for sharing. Fortunately for all of us you “make a thorough nuisance of myself at weaving events like the Encuentro de Tejedores . . and . . . have so many questions and want to be into everything and not miss a thing.” How completely wonderful and inspiring! The weavers themselves and all their amazing work it such a treat to see. And we all have you, Laverne, to thank. Thank you! Hope your US trip goes well! Looking forward to seeing and reading more. Sat night in England, nothing on telly, but Laverne on iPad. Bliss. Transported to the Americas. You give us so much iCandy weave-wise. Thank you Laverne for sharing the pics and the answers to all those ? you had to ask. Keep it up. You made me smile with that comment. Thank you! Your blog and tutorials are wonderful! Thank you for being so generous and sharing your work and techniques with all of us. Wishing you many blessings. I’ll be posting my itinerary in the future. Once I have the spring trip confirmed, I will start a page with details. Great! I’ll be sure to organize a group to study with you when you come to northern New England next spring if you wish. Please if you still have hardback copies of your second book I hope I am still in the queue to get one. I’ll purchase the first book from the Mannings or Halcyon if you don’t have any to sell with you this time. Thanks for all the inspiration you bring to your blog. 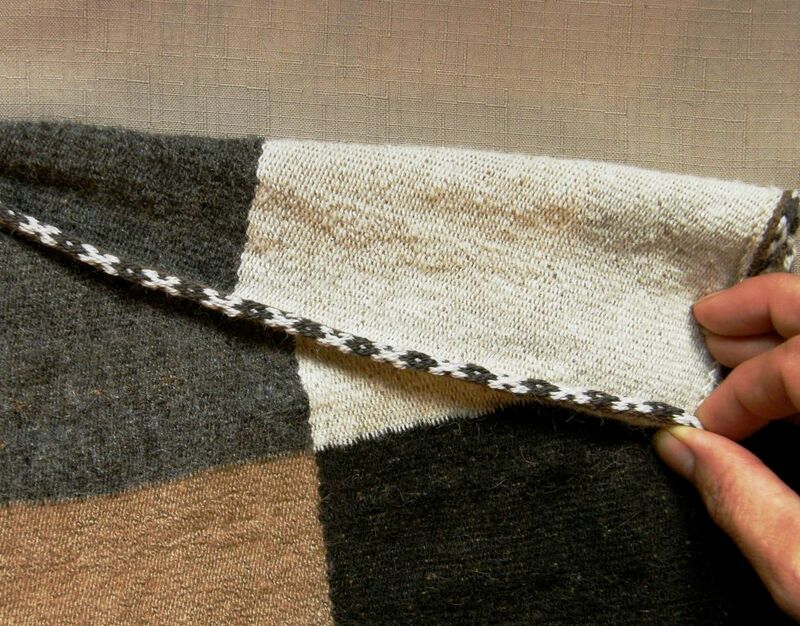 I want to learn how to do the tubular edging that is on your newest bag….after I’ve gotten better at the basics though!